I am not an authority on much of anything. Our camper is nicely equipped; it's got a stove, a bed, and a heater for those chilly nights; it's got ample room for food storage, and it's a safe haven during those occasional afternoon thunderstorms. The one thing it's missing is a commode. We did this on purpose. Our camper is small, and the last thing we wanted was to have a smelly "chair" hanging around in the corner of our living space, not to mention having to flip a coin every few days to see who has to empty the thing. So we rely on public restrooms and the great outdoors for that particular need. Mark clowning around in Bodie State Park. We've just returned from a two week trip through the American Southwest, where we camped in some remote places. If we found an actual campground (as opposed to "dry camping" on public land) it most likely had a pit toilet, since running water (and plumbing in general) is scarce in this area of the backcountry. 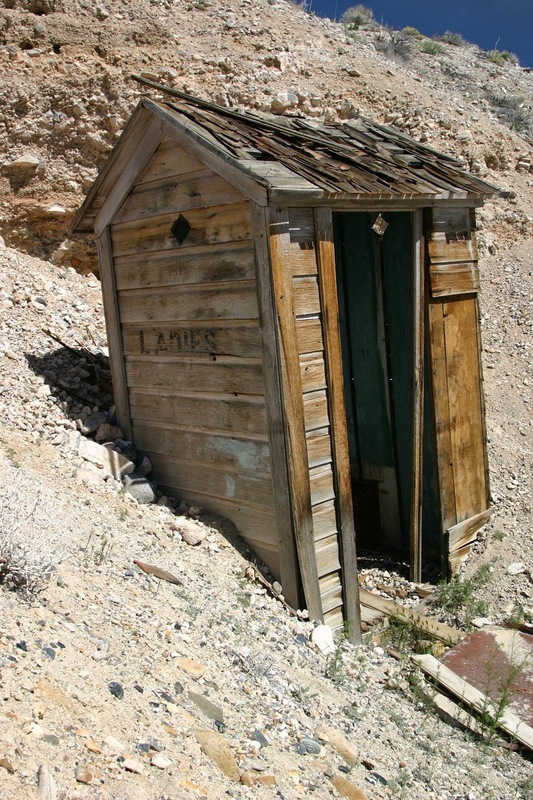 Here's where my expertise comes in: I can say unequivocally that desert pit toilets far outshine the ones in wetter climes. The extreme dry air keeps the fume level down, which definitely makes the experience easier. 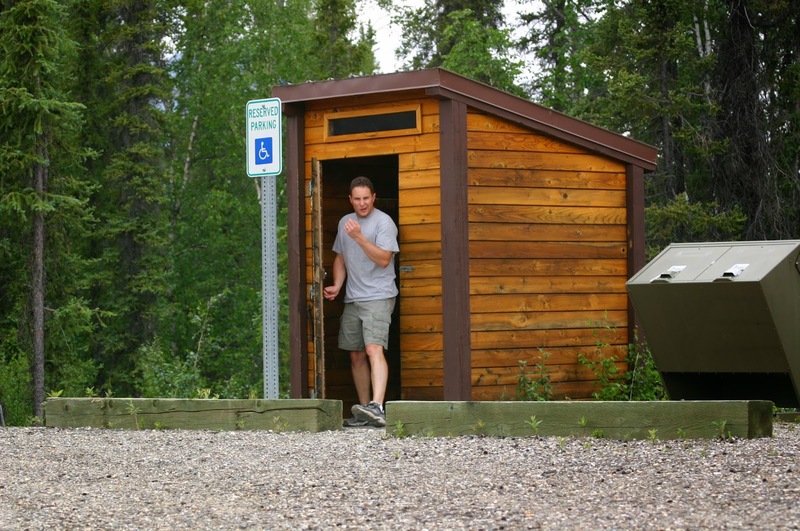 Ever try to complete a restroom stop--start to finish--without taking a breath? It's tough. 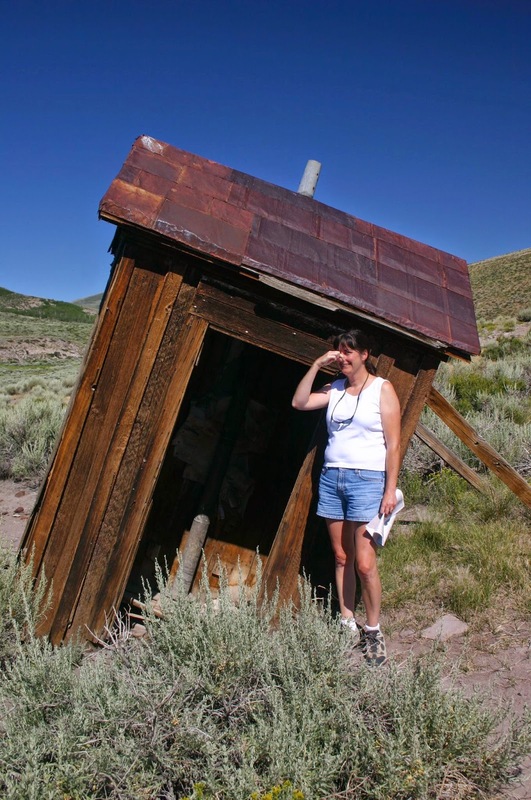 A lone outhouse in the eastern Sierra, just a bit worse for wear. Pit toilets are all constructed the same way; a little house on a concrete pad built on top of a pit, with a venting system (usually a stovepipe-looking thing) that runs up the back, theoretically venting the gases to the atmosphere without choking the poor guy inside who's just trying to transact a little business. Sure it's not the most appetizing thing to think about, but it's a necessary fact of life. Without them we'd all be walking around with little plastic bags in our pockets for pickup purposes. Gross. Always close the lid after using! It keeps the flies down and the fumes where they're supposed to be. Always put the lid and seat up if you're not going to use them during your transaction. Think of your fellow campers please. Always close the door when you leave. The cooler and darker it is in there, the less stinky and fly infested it will be for the next guy. Also animals small and large might use it as a shelter. Don't throw stuff down the hole that didn't come out of you (other than toilet paper.) Some poor newbie park employee is going to have to go in and dig it out. Please save him the inhumanity. We've all been the low guy on the totem pole at one point during our careers, and while it may have felt like groveling around in excrement, you probably didn't have to do it literally. Utilizing a pit toilet takes some getting used to, and it's not just the...uh...aroma. Even the cleanest, best maintained pit toilet--one with barely a scent and in immaculate condition--will be a little disorienting for the new user. 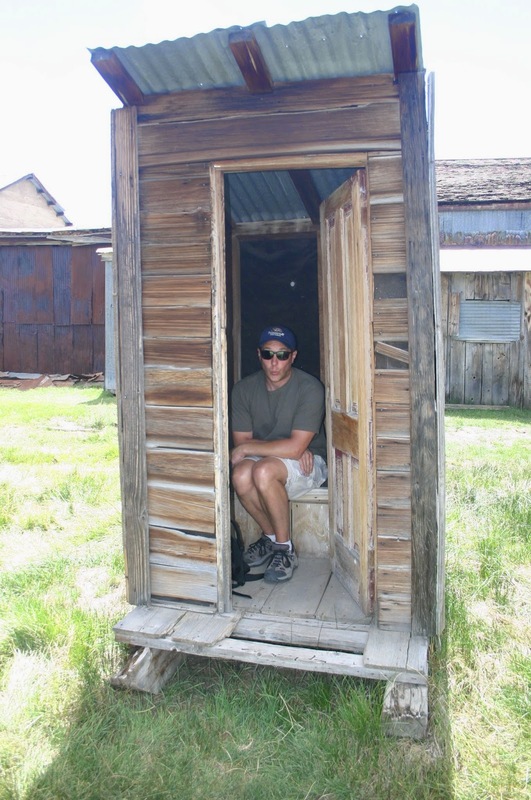 For one thing, feeling a fairly stiff breeze blowing up past your derriere is not a typical experience in the restroom but is a common occurrence in a pit toilet, especially in the windy southwest. When the wind picks up outside the outhouse venting system amplifies it as it funnels through the pit. Not being able to see where everything is going is a bit unsettling as well; it's a throwback to those "there's something under the bed" days of childhood, with the added creep factor of being in a vulnerable position should any mischief arise. The outhouse is dim during the day, but at night it's pitch black inside. There's always an awkward moment when you have to open the lid with your headlamp on, trying mightily not to shine the light down the hole. There are some things better left unknown, and what it looks like down there is one of them. This one came equipped with a solar powered light. Although most of the pit toilets on national and state park lands seem to be built from the same blueprint, they are not all created equal. I have my favorites; during this last camping trip I visited a pit with one of those deodorizer spray thingys inside and it smelled lovely (and was meticulously clean--thanks Newbie Park Guy!) The one in Red Rock Canyon State Park has walls constructed of volcanic stone and no roof--best star gazing from the throne in the state, and the fumes are vented 24/7. One of my all time favorites was at the Berlin-Ichthyosaur State Park in Nevada. Inside it's lined with Far Side cartoons, all featuring a dinosaur theme. A tasteful addition to an otherwise bland decor. This one in Coldfoot Alaska was brand new and smelled of the cedar boards they used to construct it. Once you stepped in though, you were trapped in a room with approximately 14,230 mosquitos. Mark and I have a long tradition of torturing each other when the other guy is in the "house." He started it years ago by throwing pebbles on the roof while I was using one, so I got back at him by taking his picture while he exited. This has become a bit of a tradition over the years, thus all the pictures of pit toilets. I didn't think it was weird until just now. So next time you pass one of these lonely outposts of the west, don't be afraid to have a look inside. Someone went to the trouble to build it and who knows? You might be surprised by what you find.